Seahawks free safety Earl Thomas told ESPN this week he doesn't think he would play in 2018 without having a new contract. Seahawks free safety Earl Thomas confirmed in an interview with ESPN Thursday something that has been increasingly speculated the last few months — that he will consider holding out if he has not reached an agreement with the team on a new contract prior to the 2018 season. Thomas made the comment while in Orlando for Sunday’s Pro Bowl. Thomas has just one year remaining on a four-year, $40 million contract he signed in the spring of 2014 and can become an unrestricted free agent following the 2018 season. The Seahawks, though, have typically signed who they consider their “core players” — a group to which Thomas undoubtedly belongs — to extensions before they enter the final year of their contract. That the two sides have yet to talk wouldn’t necessarily mean anything. The Seahawks have often waited until the spring or summer to do extensions, preferring to concentrate first on free agency and the draft. Thomas, for instance, signed his extension in 2014 on April 29 with Richard Sherman signing his that same year on May 7, and quarterback Russell Wilson, middle linebacker Bobby Wagner and safety Kam Chancellor not signing their new deals until the opening week of training camp the past two seasons. But Thomas’ comments put something of an ominous tone on what is one of Seattle’s biggest decisions of the offseason. Thomas’ current contract pays him $10 million a year but he will undoubtedly want at least the $12 million a year Seattle gave Chancellor before last season. But what Thomas likely really wants is to be the highest-paid safety in the NFL, a distinction that currently belongs to Kansas City’s Eric Berry, who signed a six-year, $78 million contract on Feb. 28, 2017 in which according to OvertheCap.com, he got $40 million in guarantees, including a $20 million signing bonus and the base salary of the first two years of his contract. That works out to an average of $13 million a season. He is currently the sixth-highest paid safety on a per-year average, according to OvertheCap.com. Thomas made a somewhat sly reference to Berry’s contract last June when he was asked when he had decided he would no longer consider retiring, something he had publicly mentioned following the season-ending broken leg he suffered in 2016 even if few close to the situation ever thought it was really an option. That the salary cap continues to go up, of course, makes it a little easier to top previous contracts — the cap is expected to rise to as high as $178 million in 2018 after standing at $167 million in 2017. And keeping Thomas in the fold might seem a no-brainer given his obvious importance to the team and that he is still smack in the prime of his career — he’ll turn 29 on May 7 — and hasn’t appeared to be slowing down. Conversely, Thomas would be 30 when a new contract would kick in and after setting a team record for a defensive player with 107 starts from the beginning of his career in 2010 to midway through the 2016 season has now suffered three injuries in the past two years that have caused him to miss games — seven in the past two seasons. That Thomas told ESPN he wants to end his career in Seattle might clear up any concern over whether he’d rather have a chance to move on — specifically to Dallas, speculation that Thomas himself raised when he told Cowboys coach Jason Garrett to “come get me” following Seattle’s game there on Christmas Eve. It’s also the specter of a possible Thomas holdout that has led to speculation that the Seahawks could consider trading him — if Seattle thought it was not going to be able to get a deal done with Thomas, the team could proactively solve the impasse by dealing him, likely desiring draft picks in return and probably wanting at least a first and a fourth or so. Seattle has had two other notable holdouts in recent years — running back Marshawn Lynch in 2014 and Chancellor in 2015. But in each of those cases, each player had more than a year remaining on their deals — Lynch two years and Chancellor three. Chancellor ended his holdout after two games without a new contract while Lynch ended his after eight days when the team guaranteed an additional $1.5 million in money that was already in his contract but was in the form of bonuses or future salary. It’s Chancellor’s holdout that resonates the most with the Seahawks. 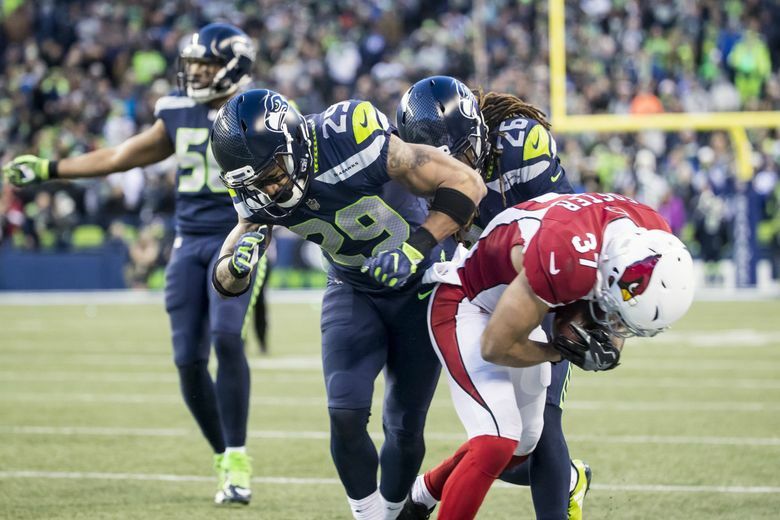 After appearing in two straight Super Bowls, Seattle lost each of the two games Chancellor sat out to start the 2015 season, which ultimately proved the difference in having to settle for a wild card berth. Seattle won’t want to go through that again, meaning one way or another, what may be the least likely thing to happen here is a holdout.